In the new Ford Ranger, you can explore the great outdoors with ease. This popular mid-sized pickup truck is designed to go over rough terrain without any issues. 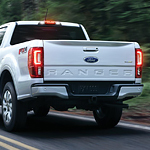 We here at Tracy Ford are excited to show you around the Ranger lineup. One of the first things you'll notice about the Ranger is its height. It has considerable ground clearance. The large wheels lift the body of the truck significantly, allowing you to drive over logs, rocks, and other common obstacles you'll come across on off-road paths. The Ranger also has more subtle exterior design features. Soft angles on the front and back end of the truck are a strategic design elements. They improve the truck's approach, breakover, and departure angles. When you drive over hills and uneven terrain, these curves will ensure that you don't scrape the bottom of your truck. Even if you do, you'll be happy to know that the Ranger has skid plates for some added protection. Although every reasonable effort has been made to ensure the accuracy of the information contained on this site, absolute accuracy cannot be guaranteed. This site, and all information and materials appearing on it, are presented to the user "as is" without warranty of any kind, either express or implied. All vehicles are subject to prior sale. Price does not include applicable tax, title, license, processing and/or documentation fees ($85 or $65 for leases), and destination charges. ‡Vehicles shown at different locations are not currently in our inventory (Not in Stock) but can be made available to you at our location within a reasonable date from the time of your request, not to exceed one week.